On a recent trip to the East Coast, I noticed that almost every restaurant served Lobster Mac and Cheese as a side dish. What could be better than classic macaroni and cheese? Yes, absolutely, Lobster Mac and Cheese! Delicious Lobster Mac and Cheese ready to be served. We have been making our own homemade version of mac and cheese for years. And recently we have used the Instant Pot to make mac and cheese when we don’t want to heat up our kitchen with the stove or oven. If you haven’t tried making homemade macaroni and cheese you have to give it a try. The taste is so much better than the boxed versions. Yes, I know that making it from the box is convenient. However, it only takes a few extra minutes to make a homemade version. Just like the boxed recipe, it is the boiling of the noodles takes up most of the time. While you are waiting for the noodles to boil, shred your cheese and when it is time to mix everything together, you are ready to go! Most of us would be tempted to use store bought, pre-shredded cheese when you are making lobster mac and cheese. Most of the work is done for you. All you have to do is add it in stir until it melts. But don’t use it!!!! I repeat, don’t use the pre-shredded cheese. 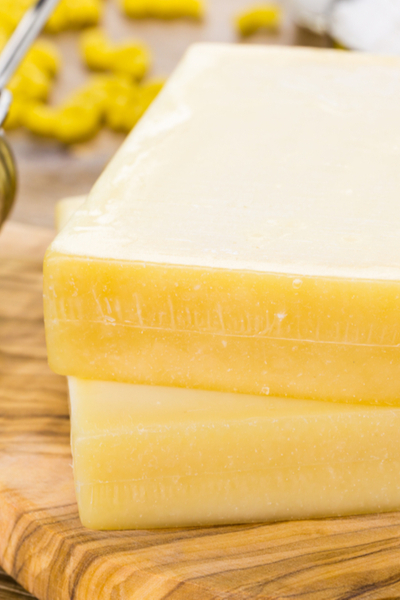 Have you ever noticed a white coating that sits on top of your cheese. You will especially notice it when the cheese is getting close to it’s expiration date. 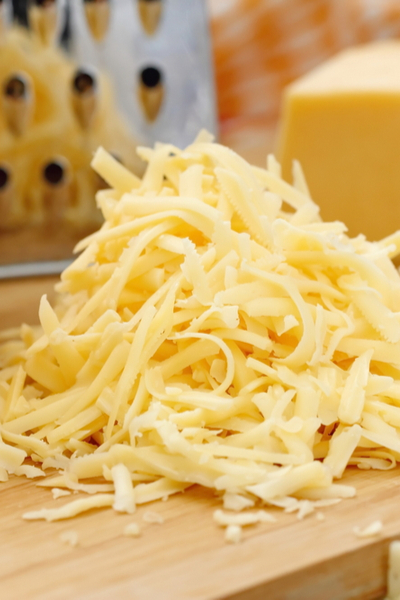 It is best to use blocks of cheese rather than store-bought pre-shredded cheese. This is a preservative used by the commercial manufactures to prevent the cheese from sticking together. This anti-caking agent will turn gritty when the cheese is melted. It will ruin the taste of your lobster mac and cheese recipe. So instead, purchase block cheese and shred it yourself. You can shred it with an old fashioned box grater. However, I prefer to shred it in minutes with my Hamilton Beach Duo Food Processor. No more scraped knuckles from using my mother’s box grater for me! It is best to shred your own cheese. We like to use a blend of Gruyere and sharp cheddar cheese. So why is Lobster Mac and Cheese the hit at every restaurant where it is served. Combine the creamy and cheesy pasta with the sweetness of the lobster and you have the perfect combination. You can use any type of cheese that you prefer, but I find that the combination of strong tasting cheeses pair well with the Lobster. Gruyere cheese is one of my favorite! It has a slight sweet flavor to it, complimented by a salty and nutty taste. 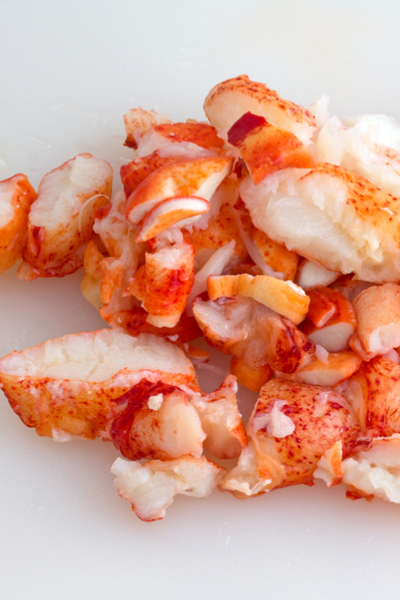 Cut the lobster into small pieces so it can scattered throughout your mac and cheese. It pairs very well with the sweetness of the lobster in this recipe. But to take the flavors to the next level, I also like to add in extra-sharp cheddar cheese to the mix. The combination of the two cheeses makes this lobster mac and cheese out of this world delicious. Because we are using cooked lobster meat for this recipe, there is no real reason to bake it in the oven. EXCEPT – that it adds another dimension of flavor that takes this recipe over the top! 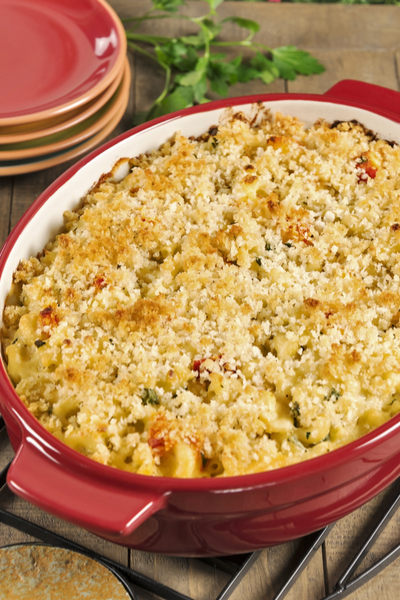 The topping on this lobster mac and cheese dish is absolutely amazing! 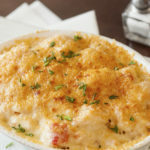 The combination of Panko breadcrumbs, Parmesan cheese and garlic and herb spice makes that initial bite into your lobster mac and cheese side dish intriguing. The crunch of the topping mixed with the sweetness of the lobster and the creaminess of the cheese makes this one of our favorite, make-at-home menu items of all time. 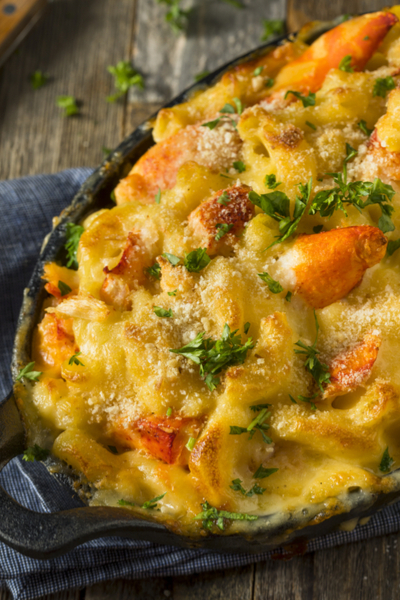 Creamy Mac and Cheese filled with succulent pieces of lobster and topped with a golden brown crust for the perfect special occasion side dish. 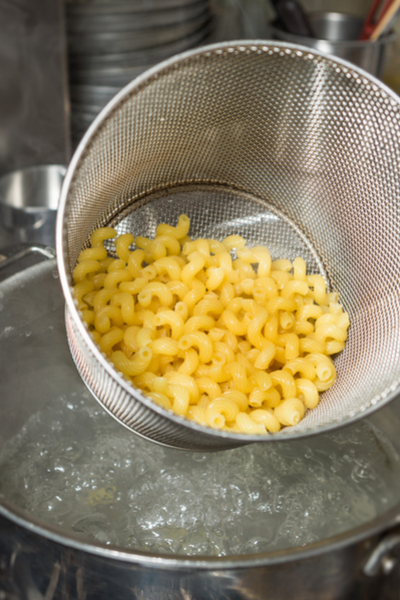 Cook the pasta per boxed instructions, in salted boiling water to al dente consistency. Drain and set aside. In a medium saucepan, over medium heat, melt 3 tablespoons of butter with the garlic. Once melted cook until fragrant, approximately 3-5 minutes. Whisk in the flour and cook for several minutes to form a roux. Add milk to the saucepan and whisk with the roux until well combined. Continue to whisk and bring milk to a simmer and cook for several minutes until slightly thickened. Remove from heat and stir in grated cheese, salt and pepper, and nutmeg. Add the lobster meat and cooked pasta to the cheese sauce, stir well. Spray non-stick cooking spray in 6 ramekins, cocottes or a square baking dish. Fill dishes with mac and cheese mixture. In a small dish melt the remaining 2 tablespoons of butter. Add the breadcrumbs, Parmesan, and herbs spice to the butter and stir. Sprinkle the mixture evenly over the top of the mac and cheese. Bake in the preheated oven for 15 minutes or until the cheese is bubbling and the top is golden brown.